A pair of river otters were recently spotted on Nile Creek in the pools above the hatchery. Not good news for the coho fry who spent their first year in these pools! It appears this visit was short lived as I suspect the pair of river otters had other issues on their mind. January-February is usually mating season. 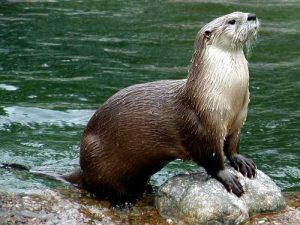 The river otter is a member of the weasel family, has a weight range from 7 to 14 kg. with a total length of 90 to 130 cm. Well adapted to an aquatic environment, otters have a large lung capacity and the ability to shut down circulation to parts of their body when diving. This allows them to remain underwater for up to four minutes. River otters current distribution is from coast to coast excluding the Canadian arctic. In freshwater streams most of their foraging is in areas where fish concentrate such as beaver ponds, eddies, mouths of tributaries and pools above and below rapids. 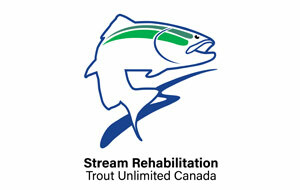 However they use many types of aquatic habitats; fresh or salt water. River otters have a rather unique reproductive cycle. Adult males travel extensively in February, searching for a mate. Pregnancy features delayed implantation, with the fertilized eggs floating freely in the uterus for 12 months, until the following winter when implantation occurs. The actual gestation is only two months with 2 to 3 kits being born in March. In the wild river otters live as long as fourteen years. Their primary diet is fish, but they also dine on aquatic insects, amphibians and occasional waterfowl. The home range of otters is quite vast, depending on food availability and population density. They are most active at night but often travel and forage during daylight hours, especially in the winter months. The river otter has few natural predators when in streams and rivers. Of course they are more vulnerable on land; the main predators are cougars on Vancouver Island. River otters are important components of biodiversity in aquatic systems. Because of their position at the top of the food chain they are and excelent indicator for monitoring water quality and pollution. Over all the river otter population is very healthy on Vancouver Island. Hopefully we can maintain this by keeping our rivers and forests healthy and free from pollutants.